Dark, brittle or thick toenails can be caused by a number of irregularities in the nail bed, including trauma, fungal infections and ingrowth. Some will heal with time, but others may need doctoral intervention. The best ways to prevent irregularities are to trim the nails regularly, avoid acrylic nails, and wear the correct shoe size. Additionally, if you frequently forgo socks, do not wear the same shoes two days in a row. Sweat takes 24 hours to dry completely and if you wear shoes too soon you risk exposing your toes to sweat bacteria, which can cause infections. Remove any nail polish on your toes. The formaldehyde in polish means that wearing it constantly (even pale colors) stains the nails by binding with and destroying the nails' keratin, leaving them yellowed. If your nail discoloration has occurred from wearing nail polish, select a formaldehyde-free primer next time to layer under your topcoat. To remove the stains now, soak your toes in lemon juice and water to help lighten them. Soak your toes in warm water for a few minutes, then wash each toe and nail individually. Cleansing the toenails can help you see any problems in the nails more clearly. If your toes are infected by a fungus (as indicated by browning, yellowing or crumbling of the nails), see a doctor for a medicated nail polish to kill the fungus. If the nail has a greenish hue see a doctor as soon as possible, as this may be the result of a bacterial infection. Determine whether your toes have suffered any trauma in the last month. 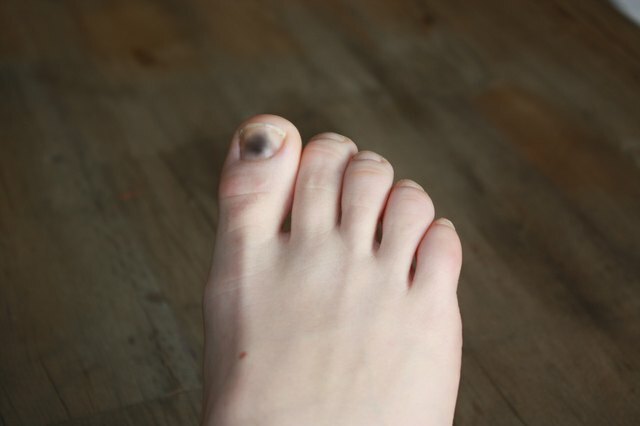 Nail hematomas (bruises that form under the nail plate and turn it a blue-black color) can take several weeks to fully form, and they cause pain and swelling of the nail bed. To prevent any discomfort, the affected nail may be drained by a doctor. However, changing the nail's appearance can take much longer. Most toenails take four to six months to completely regrow, and there is nothing that can be done to change the nail's color during that time. If you are experiencing any pain, bleeding or discomfort, consult your doctor immediately. Additionally, any sudden change to the nails should be reported to your doctor, particularly if you have a preexisting condition such as diabetes. Doctors can judge the body's health by the state of the nails, so any problems should be taken note of. Severely ingrown toenails should be reported to a podiatrist who can remove the nail's obtrusive sides to leave you more comfortable. Do not wear any nail polish or acrylic nails if your toenails are discolored or injured. Not only can nail polish make the damage worse, but it can prevent your doctor from seeing seeing your symptoms clearly.